Hello. 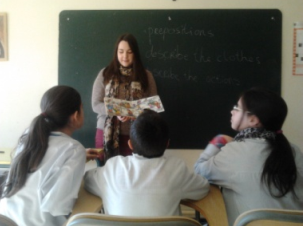 My name is Montse and I´m one of the English teachers in FEDAC –Ripollet. Rachel is an eighteen year old girl from Northern Ireland who arrived in Spain at the end of September and has been working with us for five months. 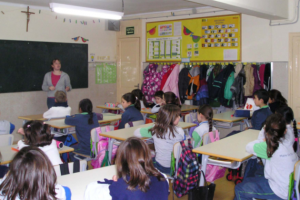 During this time, occasionally she has been with the English teacher in the classroom with the whole group showing the students a presentation about celebrations in her country and the rest of the time she has been taking small groups with her to practise grammar and vocabulary. The students have improved their listening and speaking skills since she has been with them. 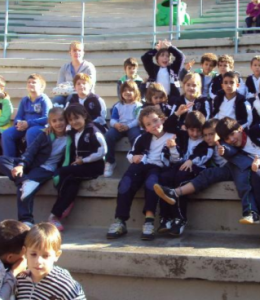 I recommend to all the schools to take a conversation assistant because it´s definitely good for the children. Hi! 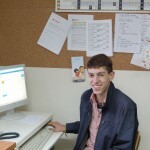 My name is Rachel and I’m the conversation assistant in FEDAC Ripollet. I’m from Northern Ireland and I’m 18 years old. I started working in the school in October and so far I have loved my experience here. Everyday I work with children from 3 – 12 years old. With P3 and P4 I stay in the classroom with the teacher and assist her in explaining activities, playing games and singing songs in English. 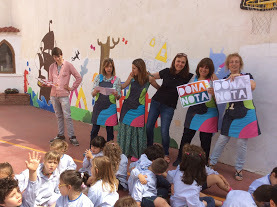 From P5 to year 6, as well as working alongside the English teacher, Montse, I take small groups of 4 – 6 children at a time out of the classroom and we practice vocabulary, pronunciation and sometimes grammar. We also play games to make the lessons fun, interactive and get the children enthused to learn English! At times, I stay in the class and do presentations about holidays and traditions in my country. The children then compare the differences between the holidays in my country and theirs. 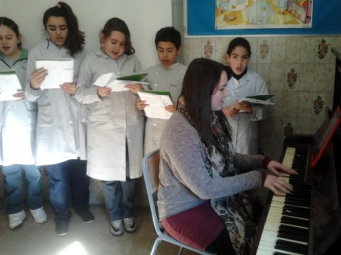 As part of the school’s multilingual project, I have been involved in playing piano and teaching gospel songs to the older children so they can perform for the rest of the school! This experience has given me lots of new opportunities (such as tutoring after school and a job in summer camps) and the chance to meet new people. I had studied Spanish for many years and now I have the chance to actually put it into practice! Katherine and her tutor Montse have also emailed us to tell us about their experience and send us some pictures. Thanks a lot! assistant in a school in Ripollet and I have to say that it is one of the best experiences of my life. Everyone out here is very friendly and I am really enjoying every moment. I work in a primary school with children from the ages of 3-12. 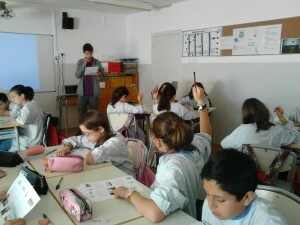 The students are very enthusiastic and really enjoy the challenge of speaking English (most of them at least!!). I have been made to feel very comfortable from the very beginning, being invited on various school trips and participating in all the school activities. The teachers are all really friendly, making the effort to speak in English and helping me in my feeble attempts to learn Spanish; they even put time for Spanish lessons with the younger students into my timetable. 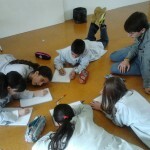 With the students I usually take small groups of 5 or 6 students from each class every lesson for half an hour and revise vocabulary with them, talk about different topics, play games in English and go over grammar. Sometimes I also give presentations about life in England to the whole class and afterwards we talk about the differences between Catalonia and England. I have also been helping in the School Song Contest. And I couldn’t have chosen a better family to live with this year if I had tried. They told me I was in my own house from the beginning of October and are making sure that I see everything there is to see in Catalonia before my time here is up. Basically this year has just been amazing and I will definitely miss Catalonia when I go back to England!